The U.S. and Iran are playing a game of chicken over Tehran’s atomic weapons program. Chances are the U.S. will swerve first to avoid war unless Israel attacks. Then it will be up to Tehran to decide how bad things become, but in the end Iran gets the bomb. Last November the United Nation’s nuclear watchdog, the International Atomic Energy Agency (IAEA), alerted the world to credible evidence of Iran’s nuclear weaponization program. Subsequently, the U.S. led the West to impose the harshest sanctions yet meant to compel Tehran to abandon atomic weapons. Iran responded to the sanctions by pledging its nuclear program was for “peaceful” purposes and then threatening that if the sanctions, especially those targeting its oil exports, weren’t abandoned it would close the strategic Strait of Hormuz, cutting off the flow of 35 percent of the world’s daily oil supply. The U.S. countered it would use military force to keep the strait open. 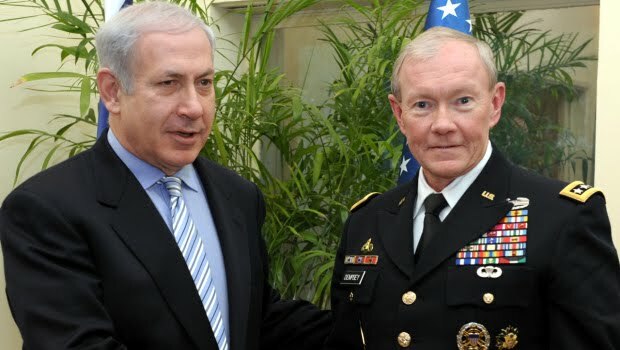 This tense standoff is complicated by Israel’s growing concern with Iran’s quickened atomic weapons pace and the growing chasm of cooperation with the U.S.
Two weeks ago General Martin Dempsey, chairman of the Joint Chiefs of Staff, was in Israel to discuss the Iran crisis. “We have to acknowledge that they [Israelis]…see that threat differently than we do. It’s existential to them,” Dempsey admitted to the National Journal. That difference explains why Jerusalem is the wild card in the game of atomic chicken. Also, the Obama administration further distanced itself from “wild card” Israel by suspending [nice word for canceling] the long-planned Austere Challenge 12 bilateral anti-ballistic missile exercise to be held in Israel. Then Obama officials denied U.S. responsibility for the assassination of Iranian nuclear scientists but said Israel should claim credit. So much for supporting our friends! Consider answers to three questions related to this geopolitical game of atomic chicken. 1. Why Will the U.S. Swerve to Avoid Conflict with Iran? A conflict with Iran would divert resources from other efforts such as the war next door in Afghanistan. Tehran already has connections to the Taliban and could easily help them further destabilize Afghanistan and provide sanctuary. Besides, President Obama is speeding up our Afghan exit which could slow should Iran step-in vis-à-vis the Iraq war. The U.S. will swerve because the new sanctions appear to be working. Clearly they weakened Iran’s currency by as much as 40 percent but that could have a silver lining. That makes imports more expensive and exports cheaper, which could actually spark the resurgence of Iran’s textile industry and reduce 20 percent unemployment, a “godsend” for Tehran’s mullahs. The only way to bring Iran to its financial knees is to impose a massive blockade like the 1962 U.S. quarantine of Cuba. That’s the view of Israeli finance minister Yuval Steinitz who opined to Bloomberg.com a “massive” aerial and naval blockade of Iran that “no one can even go out” might deter Iran’s nuclear ambitions. But a blockade is an act of war, something this administration won’t consider. The U.S. will swerve because Iran will continue faking cooperation with the IAEA. Iraq’s Saddam Hussein played that game with weapons inspectors for many years as does North Korea. Libya’s former dictator fooled the West into believing he gave up weapons of mass destruction until after the recent revolution bunkers full of chemical munitions were revealed. A team of IAEA inspectors arrived in Iran on January 29. Iran’s IAEA envoy said the visit shows that Iran’s nuclear activities are “peaceful” and “aimed at foiling the enemies’ plots and their political propaganda.” Sound familiar? 2. Why Won’t Iran Swerve? Iran won’t swerve because it refuses to “give up” its nuclear program. That program is a national symbol of greatness. Tehran means to leverage it to gain regional dominance and theologically, Iran’s conservative ruling clerics see atomic weapons as the mechanism for ushering in a worldwide caliphate, Islamic rule. Iran won’t swerve because it has the upper hand over the U.S. Tehran has President Obama scared it will shut the Strait of Hormuz, which could seriously jeopardize his re-election chances vis-à-vis another war and cause skyrocketing gas prices. Evidence of Obama’s concern came in the form of a “secret” letter to Iran’s leadership. Ali Akbar Velayati, senior adviser to Iran’s supreme leader Ayatollah Ali Khamene’l, said, “The letter held nothing new” and a member of Iran’s parliament opined Obama’s letter shows the Americans’ weakness. Iran won’t swerve because it has significant military ability, enough to close the Strait of Hormuz and hurt American regional interests. It has three Kilo class silent submarines, 19 mini-subs, hundreds of sea mines, shore-based cruise missiles, and high performance boats for swarming larger vessels. Tehran can sink an aircraft carrier and then launch ballistic missiles at regional targets to include Israel. It also has the unconventional Quds Force and proxy terror groups with a proven history of violence to disrupt the region. Last week, Ayatollah Khamene’l said the U.S. and its allies might “soon realize that they have no arrows left in their bag of sanctions.” That certainly appears to be the case, which explains why Israel is the wild card in the game of atomic chicken. 3. What Might Persuade Israel to Attack Iran? Last week Israeli Prime Minister Benjamin Netanyahu said he is working to increase international pressure on Iran, but admitted that so far sanctions are unsuccessful in halting Tehran’s nuclear program. Israel won’t wait much longer, however. Iran may be just months away from having enough fissile material for a bomb, an Israeli red line. At least two factors are at play in Israel’s attack decision. First, Jerusalem considers the alleged consequences of an attack overblown—such as the doomsday prediction that it would plunge the entire region into war. Recent experience indicates an attack won’t set off a catastrophic set of events. For example, Iraq’s Saddam Hussein vowed if attacked he would “burn half of Israel.” He was attacked but his 40 Scud rocket counterattack was a dud. Similarly the 2006 Israel war against Iran terror proxy Hezbollah caused limited harm in spite of thousands of rockets landing inside Israel. Second, Jerusalem wants to delay having to live with an atomic-armed Iran. Israel understands Iran has been preparing for an attack for years—widely dispersing its atomic weapons program in deeply bunkered facilities. It accepts that a strike may only set back Iran’s weapons program a couple years, but Israeli leaders believe a nuclear armed Iran is unacceptable and delaying that threat worth the costs. This view was expressed last week in Jerusalem by Maj. Gen Amir Eshel, chief of the army’s planning division, according to The New York Times. He asked, “Who would have dared deal with Gadaffi or Saddam Hussein if they had a nuclear capability? No way.” Then he cited a conversation with an Indian officer about that country’s response to the 2008 Pakistani terrorist attacks in Mumbai. “When the other side [Pakistan] has a nuclear capability and is prepared to use it, you think twice,” the officer replied. The U.S. will swerve first in the atomic game of chicken with Iran. But Israel, the wild card, has weighed the consequences and appears ready to attack understanding it can only delay the inevitable: Iran will join the exclusive atomic weapons club.